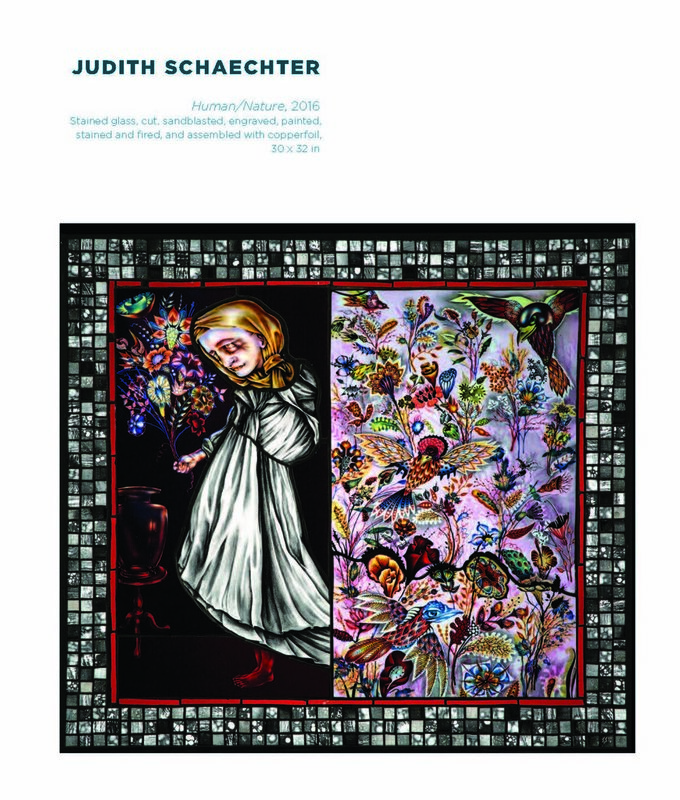 Judith Schaechter is the recipient of many grants, including the Guggenheim Fellowship, two National Endowment for the Arts Fellowships in Crafts, the Louis Comfort Tiffany Foundation Award, the Joan Mitchell Foundation Award and other awards. Her work is in the collection of the Metropolitan Museum of Art in New York, the Victoria and Albert Museum in London, the Corning Museum of Glass, the Renwick Gallery of the Smithsonian American Art Museum, and numerous other public and private collections. Bridget A. Lyons is looking forward to moving back to Santa Cruz, California, after completing an MFA in creative writing at Northern Arizona University in Flagstaff, Arizona, this spring. A graduate of Harvard University, Lyons now works as an editor and composition instructor. She has had previous lives as a wilderness guide, yoga teacher, energy bar maker, and graphic designer. Her essays have been published in Hawk and Handsaw, Atticus Review, Wanderlust, and Elephant Journal and by 1888 Center. She recently received a Voices of the Wilderness grant to travel with and write about bird biologists in Alaska’s Arctic National Wildlife Refuge. Alice Derry’s fifth volume of poetry, Hunger, appeared from MoonPath Press in 2018. Red Hen published Tremolo in 2012. In manuscript, Tremolo won a GAP award from Washington’s Artist Trust. Strangers to Their Courage (Louisiana State University Press, 2001) was a finalist for the Washington State Book Award. Raymond Carver chose Derry’s first manuscript, Stages of Twilight, for the King County Arts Award. Derry has also published three chapbooks, including translations of Rainer Maria Rilke. In 2013, with Tess Gallagher and others, Derry organized a celebration for Raymond Carver’s seventy-fifth birthday, at which she gave the keynote address. In April 2017, Derry was Peninsula College’s seventeenth Writer in Residence. Derry lives and works on Washington’s Olympic Peninsula. David Denny’s fiction has recently appeared in Narrative, New Ohio Review, and Red Wheelbarrow. His books include the short story collection The Gill Man in Purgatory and the poetry collection Some Divine Commotion, both available from Shanti Arts. He lives in Silicon Valley and teaches writing at De Anza College. Ana Belén López‘s books of poetry include Alejándose avanza (Going Forward Moving Away), Del barandal (About the Balustrade), Silencios (Silences), and Retrato hablado (Spoken Portrait). Since 2001 she has written a column called “Imágenes sueltas” (“Random Images”) in the magazine Noroeste de Mazatlán (Northwest of Mazatlán). Eugenio Polisky authored the poetry collections silencio en la nada luz (Silence in Nothingness Light), Quimera Bulevar (Pipe Dream Boulevard), and desde el fondo (From the Depths). He has translated poetry by Irene Gruss, Liliana Díaz Mindurry, Daniel Freidemberg, and Hugo Mujica into English, as well as poetry by Anne Carson and Dan Bellm into Spanish. Zack Rogow was a cowinner of the PEN/Book-of-the-Month Club Translation Award for Earthlight by André Breton and winner of a Bay Area Book Reviewers Award (BABRA) for his translation of George Sand’s novel Horace, and has won awards for several other translations.